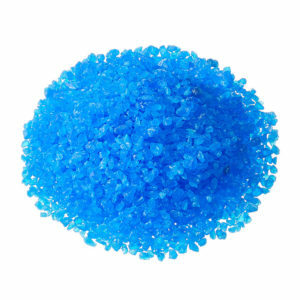 in the form of blue, medium sized crystals is popularly used as a fungicide and herbicide, analytical reagent and also feed additive. When burned, cupric sulfate produces a green flame color. Soluble in water and methanol; slightly soluble in ethyl alcohol and glycerin. is popularly used to precipitate dissolved scrap gold out of an aqua regia solution and also as a sewage treatment, fertilizers, feed additives, reducing agent, wood preservatives and process engraving. L-Lysine is the most important amino acid for monogastric species, as it is the first limiting amino acid for pigs and the second limiting amino acid for poultry. AJINOMOTO EUROLYSINE S.A.S. produces and sells L-Lysine in two main forms: L-Lysine HCl 99%: a monochlorhydrate salt of L-Lysine 99%LLB 50: Liquid L-Lysine Base 50%The liquid form (LLB 50), which was launched in 1994 by AJINOMOTO EUROLYSINE S.A.S. to meet the expectations of feed manufacturers, was immediately a great success with clients who appreciated its many advantages. 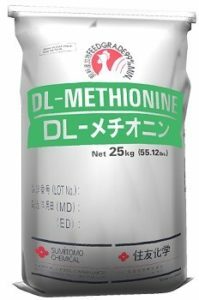 L-Threonine is the necessary complement of L-Lysine for which it optimizes the use by animals for body protein deposition and weight gain. Moreover, L-Threonine plays an important role in processes of maintenance and, more particularly of digestion. 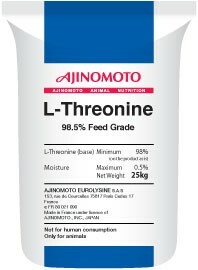 In practice, L-Threonine is the second limiting amino acid in feed for pigs and the third limiting amino acid in feed for poultry. 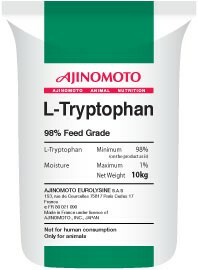 “L-Tryptophan 98% Feed Grade” is used to supplement feeds in order to meet the digestible tryptophan requirement of animals. It is particularly suitable for young pigs, because it helps to improve feed intake, growth rate and feed efficiency.AJINOMOTO EUROLYSINE S.A.S. has been manufacturing feed grade L-Tryptophan since 2000. To meet the fast growing demand, the company has been regularly increasing production capacities. 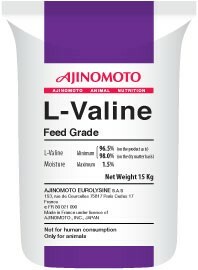 L-Valine Feed Grade by AJINOMOTO EUROLYSINE S.A.S. 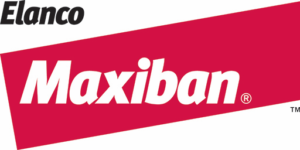 is a major innovation for the animal feed industry. The use of L-Valine in addition to L-Lysine, L-Threonine and L-Tryptophan is a guarantee of efficient feeds in terms of technical and economic performance, and improves animal farming sustainability by reducing nitrogen excreted by animals. Improve the calcic transport and the deposit of collagen in the bone structure: to guarantee a better stock of calcium, to mobilize all long the productive life of animals. LAYERS and BREEDERS: Increased of +2% of collected eggs (last 10 weeks of production). Reduction of 30% of downgraded eggs. Better hatchability rate. BPBROILERS: Better growth and bone structure. Better Feed Intake (+4%). Better bodyweight at slaughter age (+4%) and better uniformity. SOWS: Easier and quicker farrowing. Reduction of natimortality and mortality at weaning. Better homogeneity and weigh of the litter. Low doses of narasin and nicarbazin also endure less resistance risk than high-dose, single agent medications.3 And because the low dose doesn’t eliminate all coccidia, birds develop natural immunity to the few surviving organisms. Preventing coccidiosis helps protect intestinal integrity. The bird’s body can direct nutrients toward growth rather than fighting diseases. This helps power birds through the critical stages when they face the greatest coccidiosis challenge. 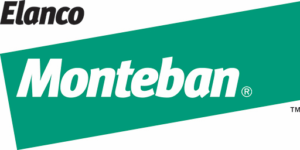 Monteban is an ionophore that prevents coccidiosis, which helps protect intestinal integrity in the starter, grower and finisher feeds. Monteban can prevent subclinical coccidiosis, which can lead to acute outbreaks. Coccidiosis prevention also protects birds from enteritis, a prevalent, costly condition. The global economic impact of coccidiosis due to decreased performance and increased morbidity and mortality is estimated at $300 million. 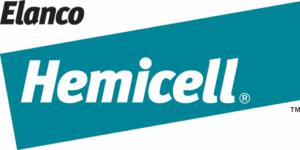 Hemicell® is an additive that presents endo-1,4-b-mannanase produced by a genetically modified strain of Paenibacillus lentus. 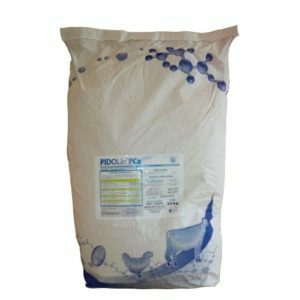 This additive is aimed to be used as a feed additive for chickens for fattening/reared for laying, turkeys for fattening/reared for breeding, weaned piglets, pigs for fattening and minor poultry and porcine species. Aroma and flavor preparation with the scent of fresh butter and vanilla intended for use in compound feeds to improve their taste. It masks the unpleasant odor of some feed ingredients, lures piglets weaned to feed dry food. Nutritional requirements of modern animal breeds are very high, this together with economic pressures result in the use of raw materials that may often negatively influence the pellet quality of feed. Low quality pellets generate fines which are then recirculated through the pelleting process. This results in reduced production throughput, nutrient reduction due to heat damage and an increase in production cost due to energy inefficiency. Low pellet quality also affects feed intake by animals on farm, which could result in production losses. During the pelleting process, feed ingredients, in the presence of moisture, react with starch and proteins to form complexes which have adhesive properties. Use of KEMBIND Maxi Dry is a good solution to improve pellet quality when fines and pellet durability are sub-standard. 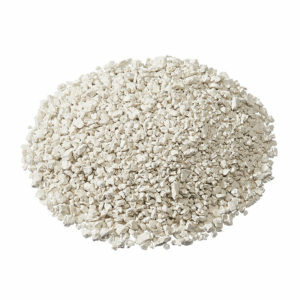 The guar gum in KEMBIND Maxi Dry is a carbohydrate with a high molecular weight from the Guar plant seed. Guar gum hydrates rapidly in the presence of water or steam and cross links with KEMBIND’s calcium sulphate to form a gel. This viscous gel binds the feed ingredients well and assists in lubricating the pellet mill die to make a good quality pellet and enhance pelleting efficiency. Myco CURB is a mold inhibitor for livestock feed, formulated to inhibit mold growth in processed feed ingredients, complete feed and total mixed rations (TMR). Myco CURB contains propionic acid blended with sorbic and benzoic acids and is buffered for improved equipment and employee safety. KEMZYME Plus is a feed enzyme that combines three different NSP enzymes (xylanase, betaglucanase and cellulase) for the degradation of structural NSP and two different endogenous-like enzymes (amylase and protease) to enhance the action of the enzymes secreted in the GIT. KEMZYME Plus is a multi-enzyme for poultry and piglets that allows to improve animal performance when used “on top”. Additionally, reformulation with KEMZYME Plus nutritional matrix allows to reduce feed cost by replacing more expensive raw materials by others with lower nutritional value and higher fibre content. The inclusion of a Paradigmox® antioxidant is the most cost-effective solution against the start or progression of the oxidation process, especially in lipids with polyunsaturated fatty acids profile. The high antioxidant activity of Paradigmox can be reached thanks to a specific production process and uniquely designed formulations based on the synergistic effect of polar and apolar antioxidants, plus a metal chelator. All Paradigmox formulas are ethoxyquin and butylated hydroxyanisole (BHA) free, additionally some formulations are also completely free of butylated hydroxytoluene (BHT), enabling a synthetic antioxidant free label. Paradigmox White Liquid is highly effective in delaying oxidation in vegetable oils at very low inclusion rates. Its efficacy is linearly related with the inclusion rate; therefore you are able to correlate the most effective dose in accordance with your requirements considering storage conditions and time parameters. RENDOX brand antioxidant can answer all your need for a liquid antioxidant. RENDOX are formulated to obtain a high performing antioxidant system. The blend of antioxidants contains a balanced mixture of synthetic actives and a chelator, all dissolved in a carrier that guarantee stability and mixability in an oily substrate. RENDOX can be formulated with ethoxyquin -RENDOX Plus liquid – or without ethoxyquin – RENDOX EQF. Maintaining product freshness, protecting quality, and increasing shelf life are essential to the development of high quality pet food. TERMOX, a complete line of liquid and dry synthetic antioxidants, is specially formulated to stabilize fats, protein meals and finished petfood products that are highly susceptible to oxidation—providing freshness protection from raw petfood ingredients through to the final product. Acid LAC™ Liquid Antimicrobial is able to optimize the effectiveness of chlorine, bacterial control and overall handling by farm personnel. Acid LAC™ Liquid Antimicrobial is an EPA-registered product (No. 8596-31) proven safe and effective. Good water quality is essential to animal health and production performance and is often an overlooked management component. Water quality management needs a program approach, including organic acids and pathogen control in water. With the reduction and/or removal of antibiotic usage in livestock and poultry production, water quality is now taking on an increasingly valuable role. Antibiotic alternatives to water line pathogen control should be considered as management practices change. Providing clean drinking water, through the elimination of bacteria and other pathogens, should be a priority for today’s livestock and poultry producers. 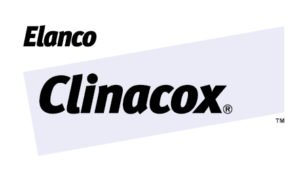 Acid LAC™ Liquid Antimicrobial provides an effective blend of key organic acids with proven efficacy in the control and inhibition of a broad range of pathogenic bacteria present in livestock and poultry water.